Many people have written worthwhile pieces this week about Russia’s invasion of Ukraine. The daily coverage has been good on Twitter and improving in conventional media; we have had insights into the shape of this conflict that we have not had before. It’s proven beyond most people’s doubt that the troops in east Ukraine are not self-defence militias but organised, highly trained and equipped groups, just as it’s clear that Russia’s assault is an all-out propaganda attack of inventions, provocations, denials: Russia has not so much occupied its little brother as occupied the truth in a wholesale invasion of lies. It’s also become clear that in destabilising eastern Ukraine, Russian-sponsored forces have exposed complicated resentments. In the Kyiv Post Oksana Grytsenko wrote an illuminating piece, “What drives the hate in eastern Ukraine”, pointing out that there’s a revolution of poverty and neglect there alongside the exploitative “pro-Russian” forces. Anders Aslund has written that Putin’s power drive needs a victory abroad in order for him to continue in power at home, and a piece on EuromaidanPR‘s website underlined that Ukraine’s politicians need to do much more to encourage civil society. 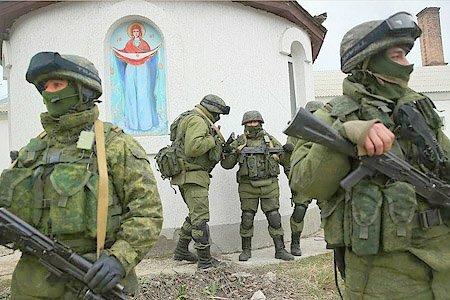 So there has not, in dramatic terms, been much to comment on since I wrote a few days ago that the invasion has already taken place – the “men in green” are in place, there are enough of them to maintain the conflict and make it impossible for the fearful administration in Kyiv to dislodge them. Its trumpeted anti-terrorist operation was a dismal failure, although soldiers reclaimed the airfield at Kramatorsk and repelled an assault on the barracks at Mariupol. There were sideshows: regional politicians, including the Dolly-Partonesque mayor of Sloviansk, Nelya Shtepa, gave anxious press conferences, changing sides as the wind changed; 6 Ukrainian Army APCs were flaunted by the Russian special forces who captured them; Sergei Lavrov got indignant about Ukraine sending tanks “against its own citizens” just as a comradely phone conversation between two Russian officers was leaked, confirming that the assault in Sloviansk had been a Russian operation. But in terms of momentum the conflict froze, like a YouTube video downloading on a slow internet connection. Everyone was waiting, most for the announced four-way talks that took place in Geneva yesterday. So? Well, they happened. You can read about them. Occupiers to disarm and leave government buildings, a general amnesty for all but capital crimes, illegal military groups in Ukraine to dissolve and hand in their weapons, and decentralisation of power and guarantees for the status of the Russian language. It was a day of optimism all round: in Luhansk and Donetsk large and peaceful pro-Ukrainian demonstrations took place at which people knelt, prayed and hoped. In Odessa another pro-Ukrainian demonstration took place along its wide boulevards. Even Putin’s weird, limelight-stealing TV phone-in at the same time as the talks in Geneva were happening failed to distract attention from what was happening there. At the back of many people’s minds, no doubt, was the thought: Ukraine and Russia have agreed to de-escalate. There will be calm and a new chapter. It has been decreed: foreign ministers have spoken. I’ll be honest. I wanted to write about the talks yesterday, but I didn’t want to rain on the parade. But what I was thinking was this: these talks will change nothing. The forum was grander, the meeting high-level and quadripartite, the deal publicly promoted on both sides. Yet there remained a whiff about it that was not of cordite but of wet fish: the wet fish of good intentions. Because the truth is, Putin could send Lavrov to Geneva, have him announce a deal, say, “Look, we agreed, of course we want this unnecessary nonsense to stop too” – and then turn around and say, “But it’s out of our hands. See? The Ukrainian people have spoken.” And the West would swallow it. Because it had the same Russian stamp of shrugging exculpation that every other Russian public statement has had. Just listen to it, one more time: We don’t want to occupy Crimea, we don’t want to send troops into eastern Ukraine, we’re not responsible for the people’s unrest there. And at the same time those utterances are mirrored by their opposites: we’ve returned Crimea to Russia, we have a right to send troops into east Ukraine, we have an obligation to protect Russians and Russian-speakers there. Now, twenty-fours later, we have the reality: nothing has changed. The occupiers in Donetsk, Luhansk, Sloviansk and everywhere else have refused to leave till the government in Kyiv steps down. No one has been disarmed. No one has stepped forward to be amnestied. There is no progress. The conflict is still frozen. Except that of course it’s not. Today, Friday, there are breaking reports of new arrivals of “men in green” into Kharkiv in the east and, newly, Odessa in the far south-west. (Odessa is an important city because it is a deepwater port, only 70 km from the Moldovan border and Transdnistria.) What has happened in the last thirty-six hours is another textbook tactical diversion by Putin: the Kremlin engages willingly in yet another unreal diplomatic contact – another frosty political duet downstage – and behind the official backdrop the rumble of the wholesale shifting of scenery by thousands of unidentified men continues. I know that there are more complicated issues beneath this polar view: eastern Ukraine is neglected, resentful, antagonistic to Kyiv’s central government, riven with grievances, and that Kyiv’s politicians are still spending too much time with EU and US representatives and nowhere near enough time risking an uncomfortable reception to make their case to their eastern cities. But let us just be clear, if we possibly can, about one thing. Let us be clear about Putin’s tactics: there is not one inch that the Russian president will give until he has to, and until he sees that he has to give it, he will go on smoothly proclaiming his goodwill while all the time he keeps on pushing forward, west, south, through, around and under – especially under – as hard and as far and as fast as he can.